Your home’s electrical system is one of its most important components. It also, unfortunately, is one of its largest -- and most prone to wear and tear. And should this wear and tear occur and result in issues, because of its sheer size, you might experience difficulty localizing the source of the issues. Instead of poking around and merely guessing at the cause of your electrical problems, simply call on the experienced local San Antonio electricians at John Jones Electric. We can quickly and accurately identify the problem with our troubleshooting service, thus helping to resolve the issue quickly and safely. Because your home’s electrical system is so important for your everyday life, you need to resolve electrical issues just as quickly as you are able to. And a way to make the repair process as quick and accurate as can be is to call on John Jones Electric for a thorough troubleshooting! Let’s say your ceiling fan is on the fritz. So, you figure it’s just a ceiling fan problem. Makes sense, right? So, what do you do? Call in for a ceiling fan repair. And your repairman comes in, tweaks some things, gets it running, leaves -- and then the ceiling fan proceeds to go out again. So, you’ll need to spend more time (and perhaps even money) calling the expert back to figure out what the problem could really be. Such a situation can be a frustrating one indeed. And if the problem turns out to be frayed wiring that poses a fire threat, you will keep yourself in harm’s way the longer you go without getting that problem addressed! Don’t suffer the frustration, and don’t put yourself at a potential fire risk or any other risk that a faulty electrical system can pose. Instead, find the source of that risk, and find it fast the FIRST time. And you can do that by simply calling John Jones Electric for a thorough troubleshooting. If you are experiencing electrical issues, don’t guess what the problem might be. Know it. And you can get an accurate answer in no time flat by calling on your experienced local electricians at John Jones Electric for a troubleshooting. 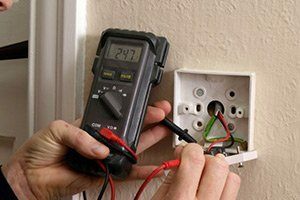 With over 30 years in the electrical business, we at John Jones Electric have the expertise to provide the quickest, most thorough, and always most accurate troubleshooting. So, with a troubleshooting from us, you’ll enjoy quality working electricity again in no time flat!